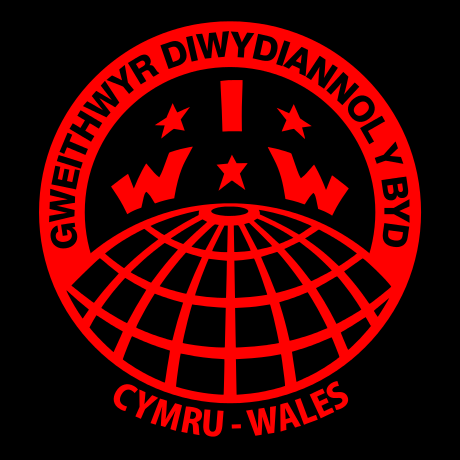 On July 14th more than 20 IWW members from across Wales met in Cardiff for the first IWW Cymru Assembly. The third-largest IWW regional branch showed itself in fine health as they discussed organising in the gig economy, anti-fascism, and organisational options for their future. Innovative support for labour organisation in the gig economy has helped Couriers Network Cymru work with IWW Cymru to deliver better conditions for Deliveroo and UberEats riders in Cardiff. James, a key organiser in the campaign told Welsh members about the challenges of organising workers whose conditions are designed to deny them the advantages of trade union membership. Gig economy workers’ position is precarious: their boss is an app and they have no workplace. Classed as self-employed, they live with instant dismissal and other sanction as a constant threat. They often fail to meet the minimum wage while working for up to 60 or 70-hours-a-week. The result of talking – and most of all listening – to couriers in Cardiff is a strong, confident and growing network that has delivered real improvements in worker safety and conditions. It can now be a model for similar initiatives wherever workers in the gig economy want to organise. Couriers Network Cymru (part of the wider IWW Couriers Network) has shown that IWW members can help by providing a forum for scattered workers, by collecting and anonymising workplace complaints before presenting grievances professionally and with impact. As our members met in Cardiff, pro-Trump and ‘Free Tommy Robinson’ demonstrations were taking place in London. The far-right is visible, confident, and active reported the chair of the IWW Anti-Fascist Committee to the assembled delegates. Organised labour has an anti-fascist history as old as fascism, and after an historical survey, discussion focussed on how to write the next chapter in that story. The meeting considered the rights, wrongs and tactics of no-platforming alongside countering fascist propaganda, and winning over those who are tempted by far right ideas. The final message was one of hope and strength: the IWW represents a powerful alternative answer to working class grievances that should be confidently voiced in opposition to the racialized scapegoating of the fascists. Welsh members agreed: don’t despair – be honest, active and visible. A successful conference finished with Cardiff and Swansea members splitting to discuss internal branch matters before coming back together to toast a hugely successful first Welsh Assembly. The IWW is strong and growing stronger in Wales with an engaged membership that is full of energy and ideas. Future conferences will surely work further to realise this huge potential.